Shanghai Centre Theatre also known as "Shanghai Theater" is home to the world famous "Shanghai Acrobatic Troup". Founded in 1951, the acrobatic ensemble is the oldest in Shanghai. This is the most polished and popular acrobatic performance in the city, with a wide variety of stunning acts. As the troupe with the most experience, the show has always stayed on the cutting-edge of Chinese acrobatics. After animal acts were banned in China the group moved on to the luxurious Shanghai Centre stage with an improved show in 2005 which continues to evolve to this day. This spectacle manages to retain it's traditional flavor through a captivating story, while presenting some of the most modern and extreme acrobatic feats. Lasting an hour and a half, this is guaranteed to keep the audience glued to their seats until the very end. The stunts are world class and range from anything between contorsionist acts to comic relief. Even the audience can get a chance to partake in the show. Also the theatre is situated at the modern Shanghai Centre building with top-notch facilities. This performance is entertaining and highly addictive as well as suitable for the whole family. Theatre: Shanghai Centre Theatre, also known as "Shanghai Theater"
— For bookings, please arrive to the theater at 7:00PM. — Also known as the "Portman Acrobatic Show"
Access: Jing'an Temple Station (静安寺站) on Shanghai Metro Lines 2 and 7. See the seat map and price list on this page. Use the online booking form or call us to make your booking. Only a confirmed booking is valid for discount tickets. We will send you an email or call you. Our staff will hold your name and wait for you outside of the theatre (exact location details in confirmation email). They will sell you the tickets. » If you are late or cannot come, contact us as soon as possible. » We are not the theater ticket window. Tickets must be purchased directly from our staff! » Please pay by cash in RMB (Chinese Renminbi). 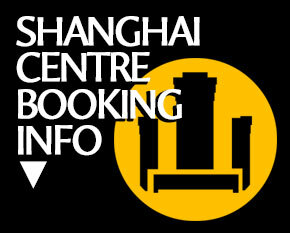 Shanghai Centre is located in downtown Shanghai and can be easily accessed by metro. The theatre is a short walk from the Jing'an Temple Station on metro lines 2 and 7. Click below for further instructions. 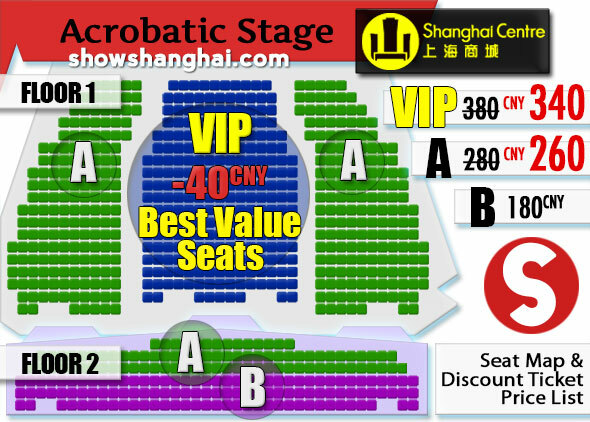 Show Shanghai offers a discount ticket service for the Shanghai Centre Theatre! See below for information on how to book your tickets. 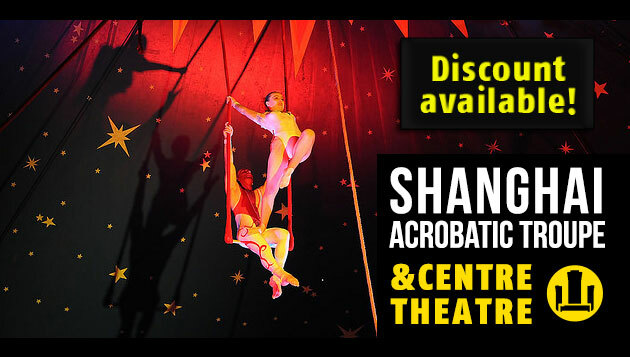 Voted as the best acrobatic show in Shanghai, make sure you reserve early so you don't miss it!